Health, lifestyle, nutrition and longevity starts with community and awareness. Join, Lukas & Berube Healthy Pet Markets, at their first annual Healthy Pet Summit. Gather together and join our expert panel of veterinarians and industry experts. Sit and learn with like minded, passionate pet parents from around the globe. Let's all create a world in which our companion animals can live healthier and thrive! We have gathered an elite set of eager animal professionals to teach you the ropes, break myths and present truth. We are pleased to have them joining us from around the United States. Get your questions ready, cap the evening off with a panel style table talk with the speakers and special guests! Karen Shaw Becker is the most followed veterinarian in the world, and for good reason. Dr Becker believes in a deliberate, common sense approach to creating and maintaining vibrant health for companion animals and an unconventional, integrative approach to addressing disease and re-establishing wellbeing in ill pets. This refreshing, proactive approach that intentionally focuses on creating or restoring wellbeing has been embraced by millions of pet lovers around the world. Karen Shaw Becker received her degree in veterinary medicine from the Iowa State School of Veterinary Medicine. Dr. Becker completed exotic animal internships in California and at the Berlin Zoo, Germany. She is certified in animal acupuncture, homeopathy and rehabilitation (physical therapy for pets). Dr. Becker founded the first proactive animal hospital in the Midwest in 1999, opened an exotic animal clinic in 2006 and a rehabilitation and pain management clinic in 2011. Since then, thousands of patients have benefitted from Dr. Becker’s unique approach to medicine. Her integrative approach to internal medicine and her passion for clinical pathology (tracking disease processes in the body), as well as her array of progressive diagnostics and innovative treatment protocols have earned her recognition as one of Chicago’s Top Vets (according to Chicago Magazine), and a special place in her clients’ hearts. Dr. Melissa Shelton is an internationally recognized holistic veterinarian, who specializes in using medical grade essential oils for complete and natural care of all animals. By using essential oils along with nutrition, whole food supplements, and other holistic modalities - Dr. Shelton has helped many animals for which traditional medicine has no answer. She is an accomplished author of several books, including The Animal Desk Reference I & II. Teaching is a passion for Dr. Shelton, and she has visited locations in Canada, Japan, Australia, U.S.A., and Europe sharing her knowledge. Dr. Morgan is a certified and accredited veterinary acupuncturist, chiropractitioner, and food therapist. 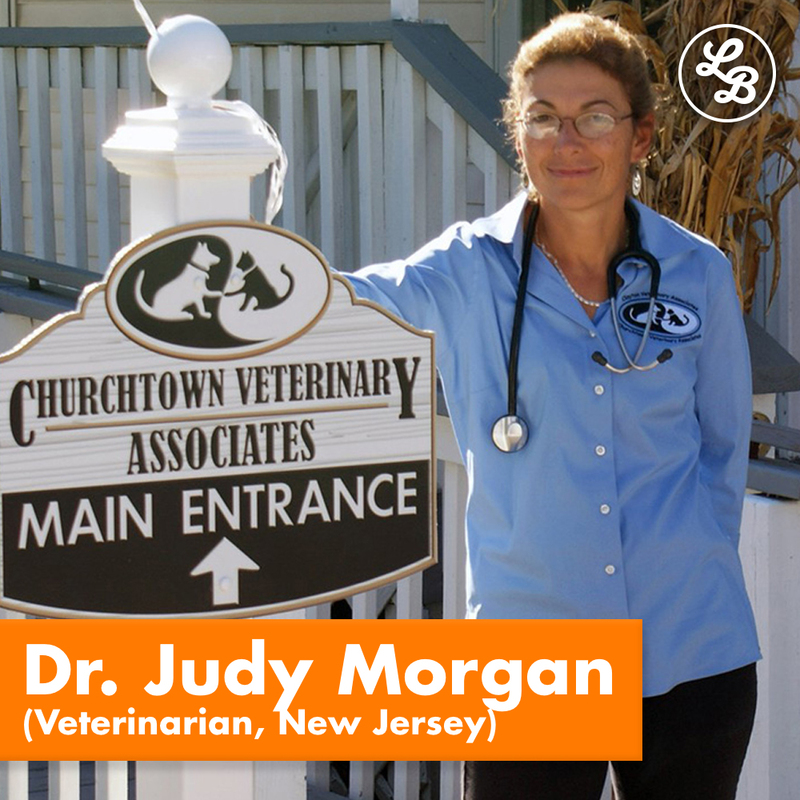 Based in southern New Jersey, Dr. Morgan currently operates two award-winning veterinary hospitals that offer an integrative approach combining holistic medicine with traditional Western techniques. She is an active speaker at dog shows, pet expos, and veterinary conferences. In her effort to educate pet owners, she is a best-selling author of four books on holistic pet care and feeding, along with hundreds of blogs and articles reaching millions of pet owners worldwide. Her weekly Naturally Healthy Pets radio show can be heard on DreamVisions7Radio. She is Chief Veterinary Medical Officer for Monkey's House Senior Dog Hospice and Sanctuary. She lives with her husband, Hue Grant, along with their six rescue spaniels, four adopted cats, eight chickens, and three horses. Veterinarian, Dr. Gerald Buchoff is Director of Holistic Pet Care animal hospital in Little Falls NJ, and CEO of Dr. B's (Longevity) Holistic Pet Products, pet food and treats. Past president of the American Holistic Veterinary Medical Association (AHVMA) and the Northern New Jersey Veterinary Medical Association. Dr. Buchoff has been featured on television and many radio networks. Dr. Coger is a wholistic veterinarian, dog owner, trainer, and breeder. Her mission is to guide owners down the natural dog care path, helping them to become educated and empowered advocates for their best friend’s health. She is an honors graduate of Cornell University’s College of Agriculture & Life Sciences, majoring in Animal Science, with a special interest and advanced training in nutrition. She received her DVM degree from Cornell’s College of Veterinary Medicine. Her “real world” experiences in veterinary hospitals both large and small, housecall practice, and shelter medicine have broadened her skills and knowledge. One of her favorite job duties is as resident veterinarian for Canine Camp Getaway, the country’s ultimate dog lovers’ vacation in New York’s Adirondack Mountains. Dr. Coger’s practice and dog care philosophy emphasize natural methods and care. She regularly integrates chiropractic, low level laser, herbal, nutritional, and physical therapy techniques into her treatment plans. She is a staunch advocate of raw, natural diets. Her first book, “Vaccines Explained: The Wholistic Vet’s Guide to Vaccinating Your Dog” is currently being updated. She is well known in the media, having been featured in USA Today, Dogs Naturally Magazine, Pet360, PetMD, and numerous nationally known blogs and websites. She has been nominated for a Dog Writers’ Association of America award for her work in the Australian Shepherd Journal. Billy Hoekman is the Natural Science Coordinator for Answers Pet Food. He is involved in R&D, product development, working with farms, science education, and does a majority of their health and nutrition consultations. He attends yearly AAFCO meetings and routinely speaks around the country on a wide variety of topics ranging from nutritional concepts to environmental concerns. He is a proud member of the Weston A. Price Foundation and is a frequent contributor to Dogs Naturally Magazine. He lives in Los Angeles with his wife Emily and their dog Lua. When booking go to www.TheGeorgeMontclair.com, Book Now button, and enter Healthy Pet Markets in the promo code box to receive a discounted room rate of 10%. Discounted rate available 10/12/18 and 10/13/18. When booking reservation mention: Lukas and Berube Healthy Pet Summit and code LKBC to receive a discounted group room rate. When booking reservation mention: Healthy Pet Summit or the code HPS to receive a discounted group room rate.